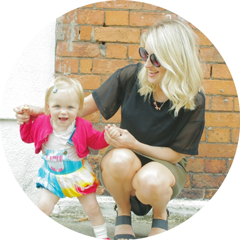 About | Lyla & Co.
Lyla & Co. // A life, style and parenting blog. I'm Emma, a hairdressing mother of one, living in Dublin. Lyla is my one year old daughter with exceptional skills in making a mess and an unrivaled ability to not sleep. In my pre-baby life, I did hair, enjoyed a good social life, worked out, travelled and liked to wear nice clothes. Since becoming a mama I have struggled to do all of the above, but am enjoying other things like playdates, the occasional daytime nap and rediscovering all Dublin has to offer with my little pal by my side.... with a few splashes of white wine thrown in for good measure. I don't have any parenting advice to offer, instead you'll find a compilation of self styled shoots, fashion finds for mama and her baby, interiors inspiration, reviews of things and places I love, and personal posts about my journey through motherhood- the good, the bad and the ugly.